EXHIBIT: George Breisch Gonzalez & Greg Mamczak: "Symbols, Origins and Meanings," new paintings and ceramics. Studio STK, Burlington. Through May 23. Environmental degradation, advertising imagery and oblique references to art history make up "Symbols, Origins and Meanings," a two-person show by Vermont artists Greg Mamczak and George Breisch Gonzalez at Studio STK in Burlington this month. Gallery owner Sage Tucker-Ketchum suggests the show's title is about "looking at the past, finding meaning in our origins, and using global symbols" to create "a visual language for today's viewers." Both of her selected artists have created technically strong and conceptually engaging bodies of work. Mamczak is a painter of strange landscapes, while Gonzalez - both a painter and ceramist - fuses art-historical forms with exotic languages and Madison Avenue Pop Art icons. Mamczak's paintings border on apocalyptic. He unflinchingly refers to Holocaust images as he heaps giraffes, buffalo, salmon, camels, horses and other creatures into piles - ironically painted in almost festive hues. 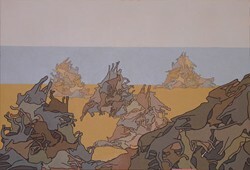 "Untitled (Stacked Horses)" is a 36-by-24-inch canvas portraying six hillocks of tan, brown and pastel-gray horses on a placid beach. The values of the piles become progressively paler as they recede into the picture plane. Mamczak's clean outlines also become finer, creating space that is somehow both surreal and naturalistic. The actuality of Mamczak's subject matter takes a little while to seep in. But once it does, and the viewer reads the horses as carcasses, it becomes unforgettable. "Untitled (Victorian House on Beach)" is a 30-by-40-inch scene with a white Victorian mansion situated to the right on another calm strand of beach. Mounds of dead fish, however, are strewn on the sand. Mamczak's dark outlines and flat colors are reminiscent of Japanese woodblock prints, especially of the ukiyo-e style, which synthesized Eastern and Western pictorial conventions. That Asian influence becomes more obvious in the mansion's companion piece, "Untitled (Victorian House on Fire)." It's a troubled night scene in which yellow and orange flames, together with stylized clouds of smoke, rise into a slate-gray sky. Mamczak beautifully captures the light of the fire and carefully replicates the positions of the fish seen in "Untitled (Victorian House on Beach)." Gonzalez's stoneware vessels, which can be up to 2 feet high, subtly adapt traditional Greco-Roman forms. His colors are earthy, and the pitchers and urns are decorated with trompe l'oeil repaired cracks. Snippets of Hebrew, Sanskrit, Greek and cuneiform writings have been transferred on to the faux shards, abutted with irregular lines. It's as if the vessels were broken and reassembled by a drunken archaeologist, and any stories the texts may once have told were forever lost in the mismatched repairs. On his 14-inch platters, Gonzalez appropriates commercial logos the way classical potters incorporated scenes from pagan mythology. The Quaker from Quaker Oats, the Morton Salt girl and the Arm & Hammer symbol are among them. The Masonic all-seeing eye from our $1 bill also appears in the center of one of Gonzalez's platters. His preferred clay is stoneware, and he's known for his raku firings. Gonzalez is also a strong painter. His acrylic "Apple of Discordia" is a vertically oriented, 26-by-30-inch canvas featuring a standing male figure with a skinless belly, like an anatomical map of the digestive system. He's about to bite into an apple. Bottles of Clorox and Coca-Cola cans, so uniformly painted that they appear to have been stenciled, line shelves in the background. The negative space is black, making this image both literally and figuratively quite dark. It repeats the theme these artists share - that something is amiss in the human-created environment. Perhaps artists are canaries in the coalmine of America's collective psyche. If an underlying mood of cynicism pervades "Symbols, Origins and Meanings," it perfectly reflects these anxious times.